So familiarize yourself with the game’s pattern of play & the pattern of the 5 Elements. Here is a way you can play MyWuXing on your own by combining Learn WuXing with Think WuXing. Deal 2 Player Decks with 8 cards each face down.The remainder of the cards act as the Universe Deck face down. Player Deck 2 is the simulated opponent deck. Take the top 2 cards from your deck & these 2 cards become your playing hand. Expose the top card of Universe Deck by turning over & placing into the Universe Pot. Choose which 1 of the 2 cards you would like to play from your hand against the Universe Card that has just been dealt into the Universe Pot. 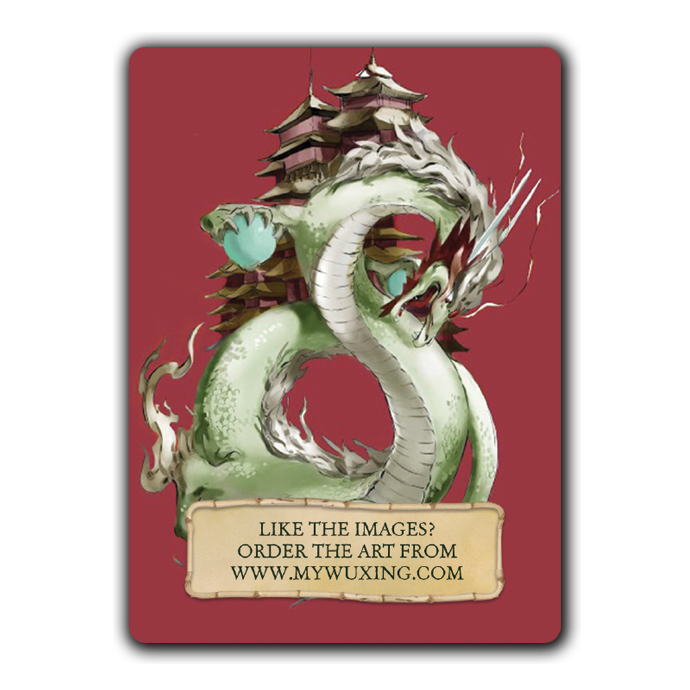 MyWuXing Rules apply – turnover the top Card of the simulated opponent deck to see if your own hand or simulated opponent hand has absorbed, destroyed or drawn with the Universe Pot. NOTE: When the Infinite Dragon comes out of the Universe Deck into the Universe Pot then a card from your player hand & the top card from the opponent deck has to be contributed to the Universe Pot as Infinite Dragon absorbs all. However, the Infinite Dragon activated (even in the Universe Pot) has to be discarded to The Void. Prior the infinite Dragon would go into the The Void if activated by a player & remain in the Universe Pot if it came from the universe Deck. Hence now Infinite Dragons now remain in the Universe Pot only when there are 2 dealt by player hands as this is a Draw & hence they are not activated. I find this gives more snap in Solo Play definitely & think that this should also be applied to the game as a whole … for now.